Until mid-week I was consumed with writing grants and reviewing grants. Both of these are a huge time sink, but only one (writing them) has any possibility of my getting paid for my time. I have a lot of ambivalence about reviewing grants, given that it seems to be a process where I crush people’s dreams on an all-volunteer basis. Then again, it would probably feel even worse if I took money for it. So on Saturday Matt and the kids went solo to Oshogatsu Matsuri (Japanese New Year festival) at the Japanese Cultural and Community Center of San Francisco (JCCCNC). This is a great event and I was sorry to miss it. They open up their gymnasium and put out tables where the kids can do thematic crafts, adults can pound mochi, and there are kendo and taiko drumming demonstrations, many of which involve our son’s classmates. If you bring a white t-shirt, they’ll screen a print of the art for the New Year on it. JCCCNC is strictly nonprofit, and all of this is free; they don’t even sell t-shirts in the event that you forget. We always forget and kick ourselves. In the Year of the Rabbit we were at least able to pull our son’s shirt off his back (he was wearing a sweater, we didn’t leave him naked) and get one. The logo for this year, the Year of the Dragon, which I have since seen on the schoolyard, was awesome. 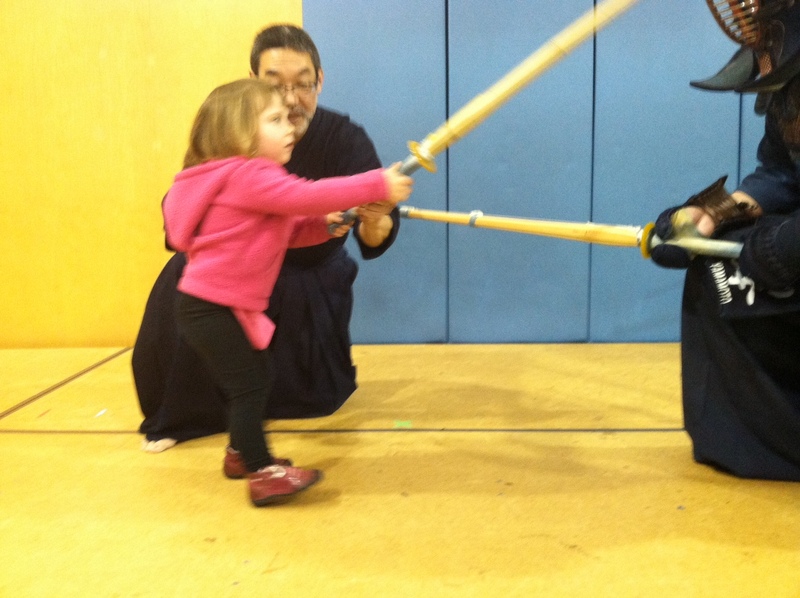 At least our kids got to hit people with bamboo swords in the kendo demonstration. Next year we’ll bring t-shirts. Always next year. Then they walked to Everybody Bikes to fix a popped stroller tire and because they were outside for longer than one hour, and frankly almost a mile is a long way to walk with two kids and no stroller, stopped at the Old Jerusalem Café next door (no longer a hookah bar; we do have some limits). Matt was able to make good on his New Year’s resolution by signing up to take a bike maintenance class. I would have resolved the same thing but he thought of it first. It’s probably for the best as we don’t have the greatest history with any kind of maintenance, so if he is injured in any way I will know I’m out of my depth. At any rate Everybody Bikes offers classes on Monday evenings. We are all hoping for the best. Basic bicycle maintenance does not appear to involve power tools so that’s a big advantage. We really need a way for one adult to haul two kids around outside the neighborhood, when we’re split up like this. Our son is willing, in fact eager, to bike, but hasn’t managed starting or stopping on his own, so leaving home, traffic and stop signs would be an issue. Long bike, tandem, long bike, tandem: decisions, decisions. For the sake of the hills I’d like a tandem—we could get some help from the stokers—but I’d also like to be able to carry the kids’ stuff around, which argues longtail. But either way we’ve spent a motherlode of money on bikes lately, and dropping the kind of money that definitely involves a comma on yet another bike seems… excessive. I’ll admit that in terms of value for the dollar our bikes are knockout performers; we’re on them 4-7 days a week in the middle of winter (granted, a California winter) after only a few months of riding, we ditched a very expensive campus parking pass, and we now fill up the tank of the not-exactly-fuel-efficient minivan less than once a month. But still. On Sunday our son had a playdate with a friend from his old preschool while Matt waited for a new water heater, which they evidently spent dancing to the Black Eyed Peas, so I’m glad I missed it. Did I mention that we spent most the weekend without hot water? It made leaving the house at every opportunity really appealing. 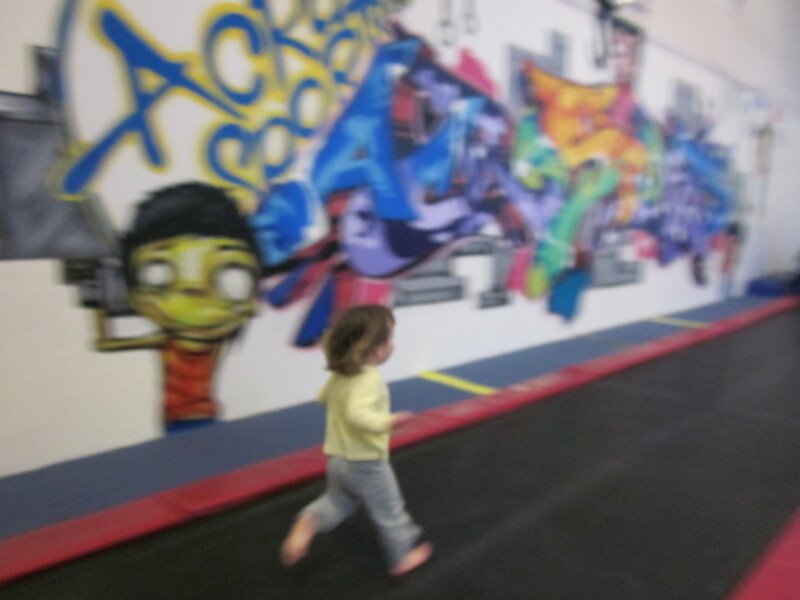 Our daughter had a birthday party at Acrosports, an old armory building that now holds circus arts and tumbling classes. Our son has been to a couple of parties there, but on the one occasion that we tried to sign him up for the class, was slow to warm to the idea of jumping off things and possibly hurting himself. This is a characteristic of his personality that has grown on me quite a lot over the years. Our daughter, however, has no such hesitation, and her only issue with Acrosports was trying to decide whether to go on the trapeze, the bungee jump, or the zip line at any given point in time. Matt couldn’t believe it was legal to put a preschooler on a zip line. I’m resigned to it given that she’s done more dangerous things without first putting on safety equipment. Ultimately she ended up taking 2 trips on the bungee jumper, 3 on the zip line (“I want to go FAST!”), and I lost count on the trapeze. At one point she fell on her head after smashing into someone while swinging on the giant rope. When I picked her up she yelled, “I want to go again!” Although red-faced and obviously winded she ran around like she’d mainlined a stash of methamphetamines collected by a student preparing for the MCATs and in a rare moment of self-awareness she agreed, after 90 minutes, that she would in fact need a nap today. We walked to Acrosports, meaning I carried her all the way there and back; we took the university elevator because I’m a glutton for punishment but not insane. It’s only half a mile but it’s basically a straight shot downhill and then back up (which is why I didn’t bike; there is little joy in that particular ride). Our neighbors who live up the block drove to the party. I still find this bizarre; parking is horrific so they ended up in a spot that was about 200 feet from where we boarded the elevator to go back home. When our daughter was sleeping Matt took our son to the Exploratorium. This would normally have been a nice trip through Golden Gate Park and then the Presidio by bicycle but Matt brought his parents and nephew. To my knowledge, none of them has ever ridden a bike, and they hate driving in San Francisco, so ultimately Matt packed all of them into the van and drove there himself. It was easier for them, and we came home to celebrate his mom’s birthday; everyone got a cupcake. So it was a lot of weekend, the kind that makes us happy to live in San Francisco, where there is so much to see and do and learn, but also a little overwhelmed. The kids were frustrated that they didn’t get to ride somewhere; our daughter spent Sunday night telling her grandmother about the holiday lights ride. I am eager for summer, when the days are less packed and we can ride late into the evening.